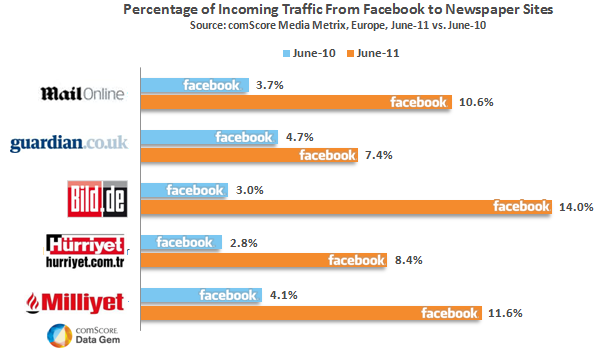 Newspaper website traffic is on the rise in Europe, and Facebook’s importance to those sites is growing, according to new data from comScore. The figures show that in June this year, Facebook accounted for at least 7.4% of traffic to the top five newspaper sites in Europe – almost double what it was a year before. Germany’s Bild saw the biggest increase, with its percentage of traffic from Facebook increasing from 3% in June 2010 to 14% a year later. Interestingly, The Guardian, which in 2010 had the largest percentage of Facebook-derived traffic of the newspapers listed, saw the smallest increase, up by just 2.7 percentage points. 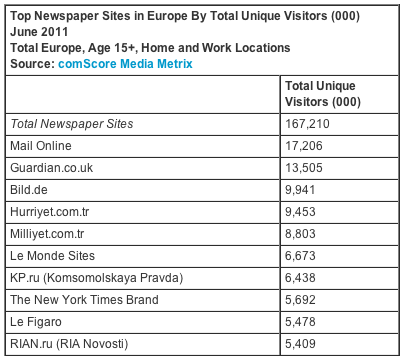 In all, European newspaper site audience increased 11% between June 2010 and June 2011, according to comScore. The Daily Mail’s website Mail Online (which has been in hot water this week over unattributed image usage) proved the most popular newspaper site, with 17,206,000 unique visitors throughout June, The Guardian and Bild took second and third place. While comScore data should be taken with a grain of salt, as physical newspaper circulations drop it will be heartening news for publishers that website visits are trending upwards – they just need to find a solid way of making enough money from them to compensate for falling print sales.